Samples of Bail Motions that Really Worked! By ordering any of the below class handout examples, buyer understands that published case cites should be researched to assure that current precedent has not been superceded, that all sales are final, that each set of documents is for educational purposes only and hereby forever releases and forever discharges Bailspeak, and its/their agents, heirs, executors, administrators, assigns, and successors in interest of an from any and all claims, demands, damages, causes of action(s) and debts whatsoever, in law or in equity, which, may or may not occur either directly or indirectly from purchasing any of the above for information purposes only bail motion packets. You should always consult an attorney who practices law with an emphasis in bail law before moving a court. Included in the total Cost of this Special Bailspeak Offer! 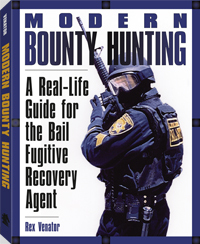 This "Modern Bounty Hunting" Book Included in this Special Package Deal! Declared "The bible of bounty hunting" by Fugitive Recovery Insiders. 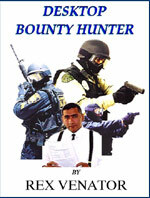 This Book "Desktop Bounty Hunter" Included in this Special Package Deal! "I would like anyone reading this to know one thing. Rex knows this business! I've had the distinct pleasure of apprenticing with, and working side by side with Rex. I can definitely say from firsthand experience that when it comes to working all aspects of a bail recovery case Rex's knowledge is unparalleled, especially when it comes to the legal aspects of avoiding liability. 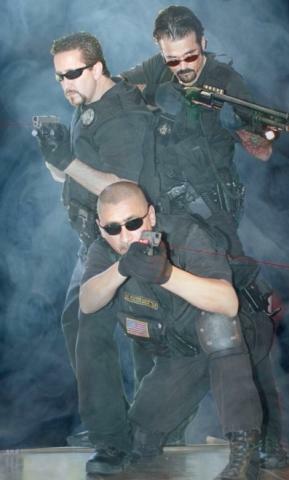 When it comes to being tactical in the field, well let's just say that I wouldn't hesitate to clear a house with Rex as my partner. With the knowledge I gained through working with Rex I was able to land a position as a full time bail investigator with a major bail agency here in California. If it hadn't been for my association with Rex I wouldn't have had the success I've had so far in the fugitive recovery business. In just four months I've successfully closed out over 50 cases and I've saved my company over a half million dollars in liability. So far, not one of my cases has gone into summary judgment, and I've kept myself free from liability as well, and that all comes from the basics that I learned about this business while working cases with Rex. 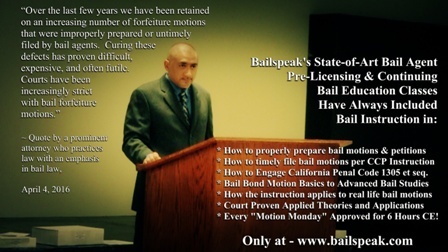 The number of currently licensed bail agent and bail bond company owners seeking assistance with bail motion assistance is skyrocketing and in combination with attorneys who are seeking more information about bail law and motion to the extent that the Bailspeak Package Deal on bounty hunting and advanced bounty hunting law and motion orders made this page necessary to meet the growing demand. 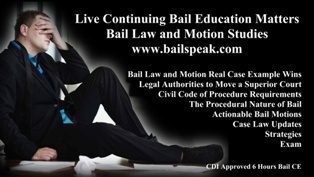 WHY SHOULD ONE CONSIDER LEARNING BAIL LAW AND MOTION? Without fail, telephone calls eventually arrive by people who harbor an undertone of acute desperation, brought on by an intangible apprehension of the unknown in combination with the potentiality of loss, that seemingly forestalls problem solving synapses from firing, and the consequences of inaction are far-reaching and possibly catastrophic to even the most modest of living standards of not just the callers but also their families and employees and all of which are subject to minor and even considerable conversion from what is to what may have to be. My standard reply to such folks is contact an attorney who practices law with an emphasis in bail law for legal advice, for the time to learn what a bail agent may and may not do and how to do it is before calamity strikes. The filing and appearing on one’s bail bond motions is time-sensitive; it requires a working knowledge of bail law; it requires a working knowledge of civil procedures; it requires an ongoing knowledge of published case cites to determine what may or may not be actionable, and, if you are a bail bond company owner, treat this area of study like the solvency of your company depends on it. Avoid Summary Judgments – Avoid Bankruptcy – Earn Huge Commissions! LAWYERS know the value of what is below on this page and with some saying there is “...easily $50,000.00 in billable hours...” had they themselves done the work! 10, 20, and 30 Year Bail Bondsman also know the value and both lawyers new to bail law and veteran bail agents have scooped up the below package deal of research documents for educational purposes. GETTING PAIDas a PC 1299 compliant bounty hunter is a much more complicated proposition than what is plainly visible on the surface of a simple premise—find and book a bail jumper. Let us set aside that first a newly certified bounty hunter and even a veteran bounty hunter must first find bail agency owners or bail corporation policy makers who will hire them; this “horse before the cart” reality is inescapable and yet remains entirely possible. 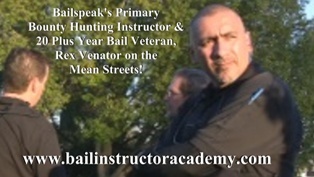 Here we can conclude the facts in evidence supporting proper bail education is more than empirical because there are many, many more folks reporting in of their successes entering into the California Bounty Hunting Industry; however, it is beyond contestation that those who are successful in bounty hunting are hard working, never give up, self starters that see life filled with opportunities versus seeing life filled with insurmountable obstacles. Let us get back on point and advance this opinion editorial with an emphasis on how top tier bounty hunters with roots in Bailspeak are now surpassing my own bounty hunting income, which was my goal from day one of starting Bailspeak. These fine men and women are extremely proactive, well educated, and with many managed by Bailspeak educated bounty hunting division managers. I, myself, as a self-admitted “part-time” bounty hunter since January 1, 2013 have been extremely busy on bounty hunting investigations, but my approach to such matters is multi-pronged and with many incoming bail jumping cases being farmed out to, well, Bailspeak Alumni whenever possible. The accompanying photo was taken because I was surprised at how far behind I had been in having one of my sets of advanced bounty hunting uniforms ready to go; indeed, I had some ironing to do on my dress shirts. For a while there, I seemed to be living in courtrooms from early April until late June where, well, I was working to get paid as a bounty hunter—in open court. It struck me that attacking a bail bond forfeiture in court is structured like attacking a bail bond forfeiture on the streets: I accept a case; I study the case file; I secure more documents for the case file; I investigate; I strategize; I then prepare for direct action but not always with body armor, a team, handcuffs or a pistol; I don a three piece suit and walk through metal detectors to make an argument in front of a judge based on self generated moving legal papers—bail motions, as a licensed bail agent and agent for multiple sureties. The prep to street bounty hunt or court bounty hunt really isn’t that much different in terms of end goals. Each methodology requires proper bail education to learn how to approach bail bond forfeitures legally and safely. I will contact Bailspeak Alumni bounty hunters who are PC 1299 Compliant, fully equipped with safety equipment, geographically in proximity to the prospective client, and capable of prosecuting a bail jumper investigation with that “failure is not an option” mindset. Can anyone be a bounty hunter? No. It takes a person with a warrior’s spirit, a military sniper’s patience, the compassion of a doctor, the mind of a strategist, and a student of the hunt. Can a person become a bounty hunter? Well, that is up to the individual, and, often overlooked, it is also up to the individual’s family who must be supportive of a new bounty hunter’s chosen path filled with difficult tasks.